New York - Fou Shop and BIGGERCODE Gallery are pleased to announce our first collaborative exhibition - Ren Studio: Extraordinary Ordinary, which will be on view at the BIGGERCODE Gallery from December 20, 2017 to January 27, 2018. 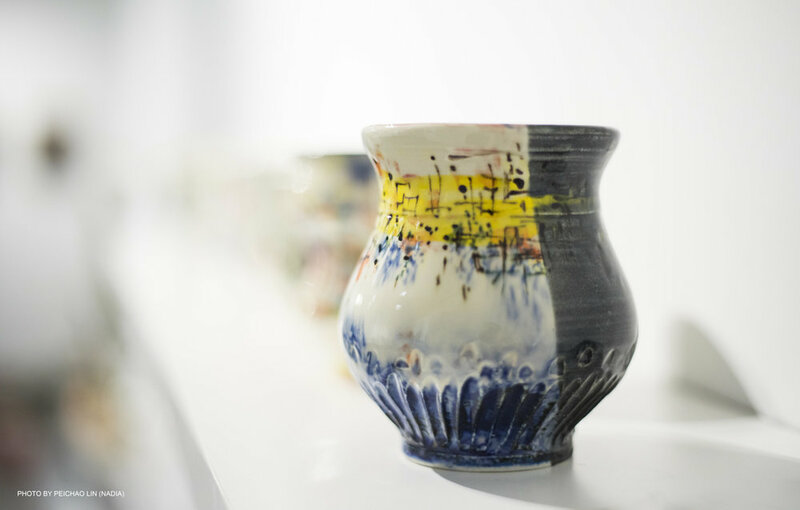 In the exhibition, Ren Studio will present the latest series of functional ceramic works including serving vessels(mugs, bowls, plates), teapots, jars, and vases. Each unique object connects the creator and the owner, and tells its own story in everyday life. The opening reception will be held at BIGGERCODE Gallery from 6 to 8 pm on December 20, 2017. 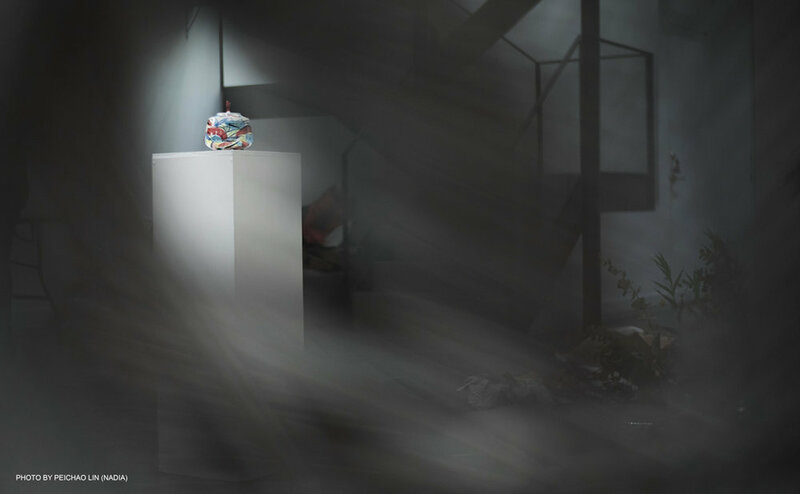 Renqian Yang, the creator behind Ren Studio, seeks to break the boundary between painting and ceramics, while searching for a delicate balance between the two media. For Yang, clay is her canvas. 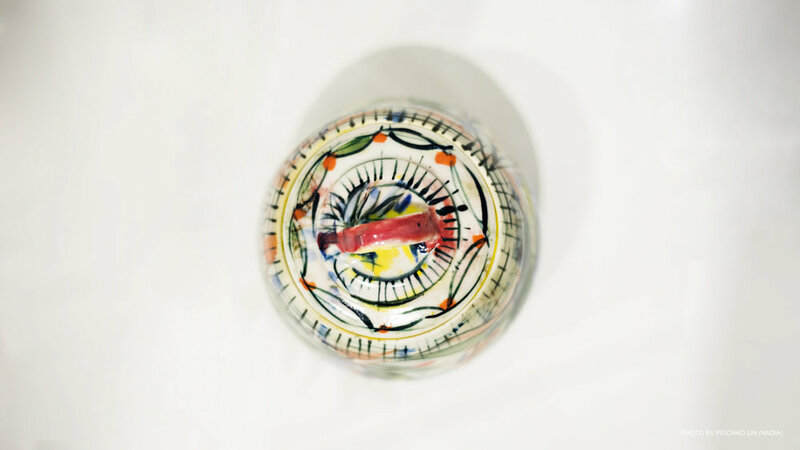 The flowing details, vivid brushstrokes and changing hues on the ceramic works all hold a strong painterly quality. *The Press Release is written by Jiawen Song. English translation by Aubrey Wang, Jiawen Song and Echo He. Becca Wu, the founder of FlowerSnob flower studio, will present flower arrangement specially designed for this exhibition, which will be shown together with the ceramic works of Ren Studio in the opening reception to reveal the extraordinary beauty of the ordinary daily life. Ren Studio Founded by Artist Renqian Yang, Ren Studio has been designing and creating all different kinds of ceramic works. Regardless of the mass industrial products nowadays, Ren Studio still stubbornly starts from a mundane mud, pauses and thinks about every detail, making its unique functional ceramic works coagulate time and memories. 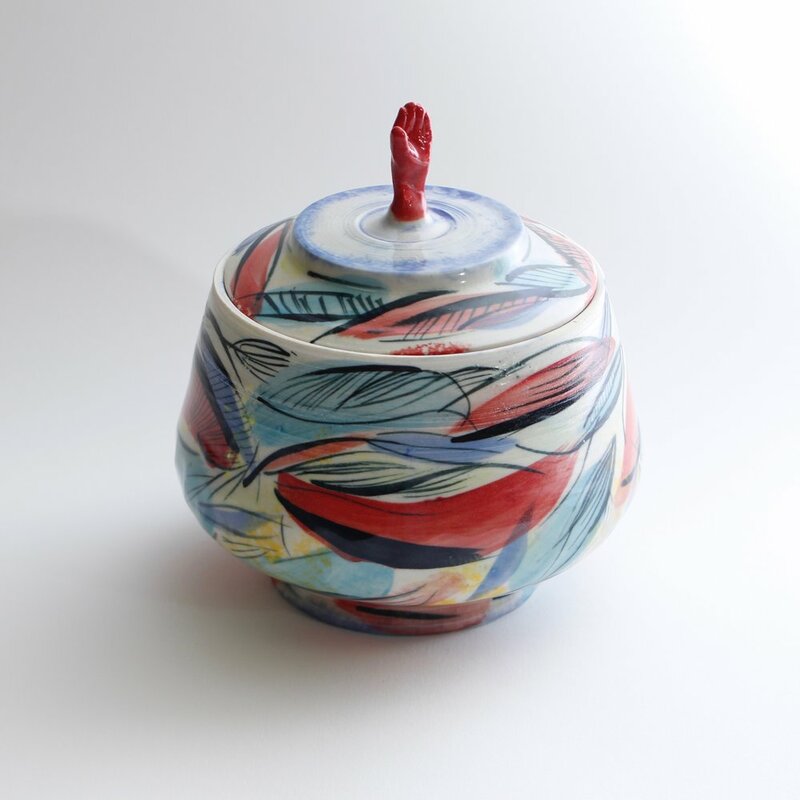 Renqian Yang obtained her BFA in ceramics from the Sichuan Fine Arts Institute in 2009. In 2014, she graduated with her MFA in Ceramics from Syracuse University, New York. Currently, she lives and works in Oswego, New York as an artist and Assistant Professor at State University of New York at Oswego. Renqian Yang at Watershed Center for the Ceramic Arts ©2017 Ren Studio, courtesy Fou Gallery. 否商店（Fou Shop) As an extension of Fou Gallery, Fou Shop also holds the same value that enjoying art is an essential part of everyday life. Fou Shop offers exclusive and limited edition works of art, design objects, accessories and home goods, which are often unique piece made in New York. More importantly, we only select pieces that connect you and the creator. It means a fine piece with an enjoyable soul and a lasting memory. BIGGERCODE Gallery was founded with the boutique shop BIGGERCODE in SoHo in 2017, with the mission of bringing art to a broader audience and nurturing emerging artists. It has established its reputation for introducing fresh, contemporary, and often interactive work by rising talents around the world. Text: Echo He; English Translation: Echo He, Jaymee Sheng. December in New York is not that cold yet, which makes a light snow day a pleasant surprise. It falls on the snowflake ornaments on Fifth Avenue, on the scarlet rose bushes in the strawberry field in Central Park, on the white tent next to the ice rink in Bryant Park, and on the wooden frame of a brownstone building in Brooklyn - this is the home of Fou Gallery, an apartment gallery and creative lab. Night deepens. Light on the second floor of the gallery is still on. Tao Xian, having just finished the last oil painting for an exhibition at Gallery 456 in January, is composing a mural on a blackboard with fluorescent chalks of green, pink, and canary yellow flitting around. The quivering Rockefeller Center Christmas tree perceived in a moving camera lens is where her inspiration comes from. The real Christmas tree will soon be forgotten after the short holiday season. What’s captured in the image is a phantasm in the shift of time, carrying all sorts of emotions - joy, melancholy, reminiscence. In a studio adapted from an abandoned factory in Long Island City, Michele Fan, founder of Atelier F, sits quietly at the table. A new batch of ceramics just came out of the kiln. Waterdrop pottery sets are arranged neatly in front of her. She glazes them one by one patiently, letting the color drip naturally around the rim. These earthy tones will surely bring a fresh breeze to the holiday show. Founded by Liu Ye and Hsinchun Wang, HCWD Studio is also in Long Island City. An unexpected meeting with Michele Fan at Fou Gallery led to a new collaboration - WA series tablewares. Inspired by the wavy structure of recyclable corrugated wrap, the idea is to transform humble materials into everyday objects with a durable lifespan. HCWD Studio also collaborates with artist Jojo Chuang to create ISOGrid mirror, an extension from Jojo Chuang’s distinctive Isometric series. The diamond/cube-shaped mirror is the basic unit of the isometric grid. Additionally, the reflective surface in the grid system extends the horizontal depths and plays with the viewers’ perceptions of dimensionality by providing such unique experience. All the ceramics at GEZIceramic are hand painted and fired by Gezi Cao. She documents fragments of city life and odd iridescent dreams with illustrations. Each piece of ceramic has its own illustrated story and can be displayed as an artwork, or used as daily kitchenware. Gezi hopes that the person who takes them home will also bring their stories, and keep dreaming new dreams. Inside an apartment in Queens, Teng Teng is delineating a miniature from Microcosmbytengteng intently. She paints one after another colorful mini universe on a coin-sized silver frame, from sections of masterpieces by artists like Botticelli or Matisse to a scene around the street corner to the mortal world. After finishing each miniscule painting, she frames it carefully. The miniscule painting can then be hung on the wall for people to admire or worn around the neck as an exquisite piece of jewelry. WE LIVING is a furniture brand founded in New York in 2016. Two founders Yifan Yang and Kaichuan Wang use “WE” to stand for West & East. This describes their design approach--a celebration of Western contemporary and Chinese traditional furniture making. The Dovetail End Tables are used as the special displays for the holiday show. Dovetail joints are both structure and design element, which create a beautiful two-tone contrast with table top. In addition, WE LIVING is going to launch The Dovetail Incense Holder. Simply constructed by the dovetail mechanism, the incense holder presents an abstract miniature landscape of mountain and river to offer a moment of Zen. Incenses were used to measure time in ancient China, and this design specially showcases a horizontal trace of time passing by. Poché Arts will present The Zodiac Calendar, inspired by ancient Chinese mythology about twelve animals heading for a race on the emperor’s birthday to win a year named after them. Designed by Minglu Zhang, the popular icons were given a new architectural interpretation with imagined construction of walls, stairs, and columns. 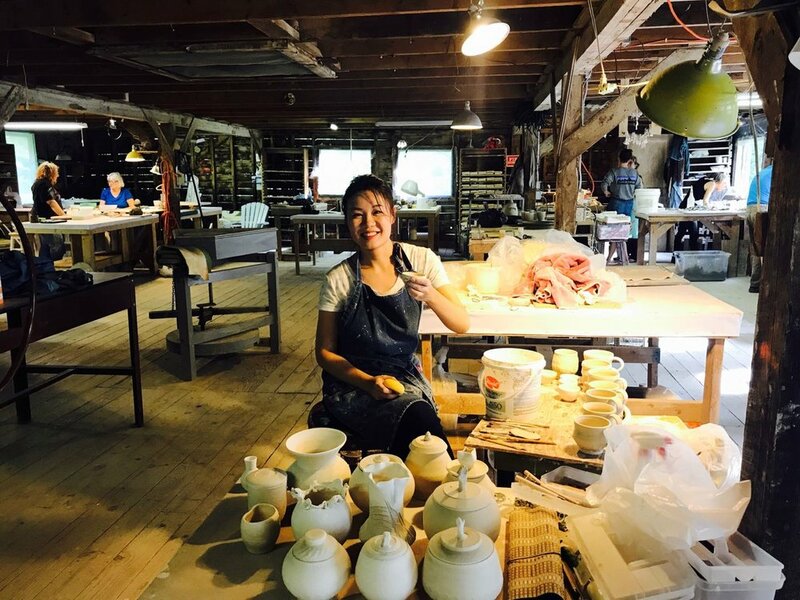 Ceramic artist Renqian Yang, who teaches at St. Lawrence University in Upstate New York, works diligently in this holiday season. As the school goes on break, the campus is quite serene. It helps her focus on polishing each piece of work. 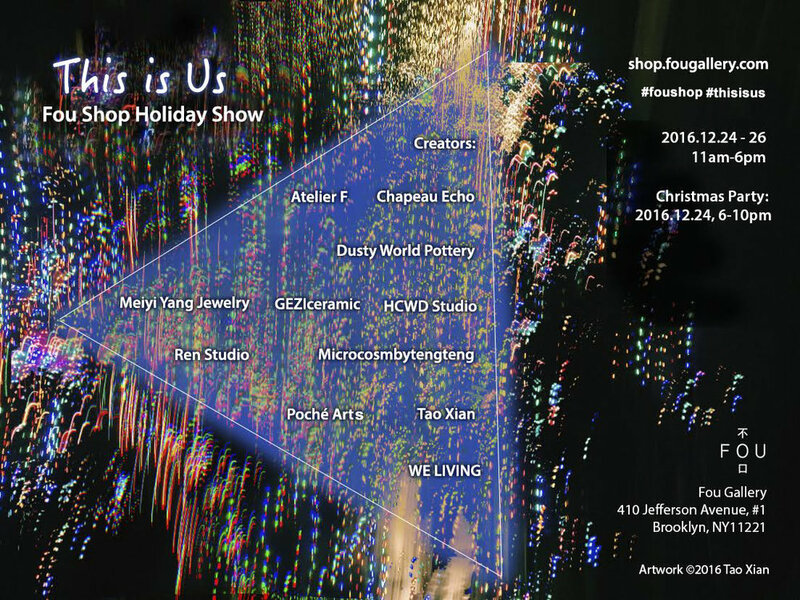 She is working on ceramic sculptures, and oil paintings for a solo exhibition in January 2017 at Fou Gallery, as well as on delivering a new series of mugs, bowls, and vases for daily use from her brand Ren Studio for Fou Shop’s holiday show. These ceramic wares look like three-dimensional abstract paintings with oriental color scheme and expressive painting techniques. Zhang Lu is working on multiple projects as well. Her works are shown in an exhibition currently on view at the Museum of Chinese in America and working part-time at Greenwich House Pottery. 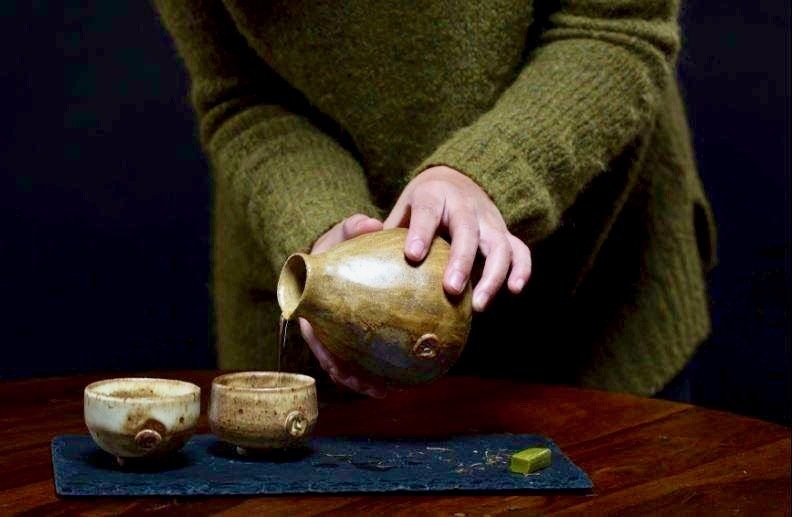 Dusty World Pottery is a brand she created in her spare time, which focuses on unpolished Japanese-style potteries, sake sets for two, and raw water jars like those in Dutch still life paintings. 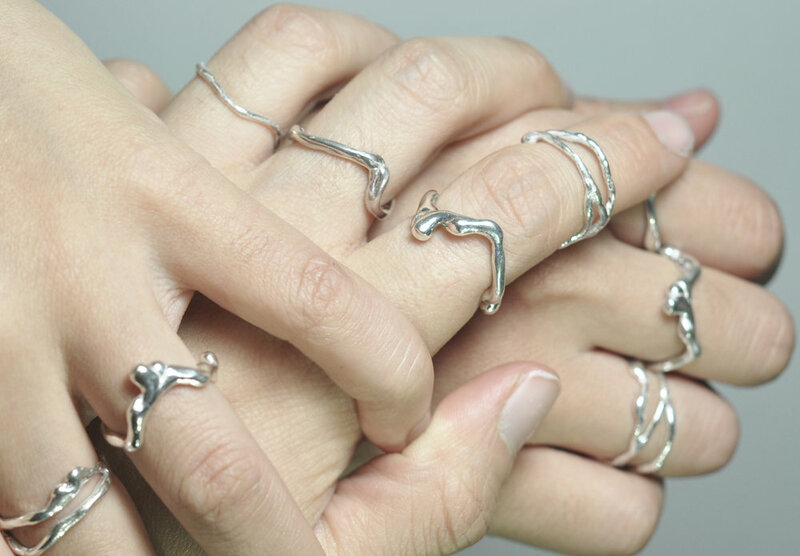 Another creator who tells stories with her work is Echo He, who founded Chapeau Echo in 2013. Each hat is handmade and has a story behind it. She created a special holiday series for the show. Titled after classic holiday songs, each features a holiday themed vintage jewelry piece that Echo carefully selected from all over the world. Shining Christmas tree, modern reindeer, witty Santa Claus and crystal snowflakes are transformed into lyrics and come into new lives. Outside the window the snow is getting heavier and heavier; inside, the chalk powder is sprinkling like a mini snowfall. Still image of the fragment slowly unfolds on the blackboard, as if echoing the undying Christmas lights of Rockefeller Center in the distance. Just a bit more finishing touch, we are waiting to share the holiday with those we cross paths with.